Thinking you need a four-wheel to drive around the world is a myth we unraveled years ago when crossing Asia. Even though a four-wheel drive does have its advantages, it is by no means a necessity. Our faces turn into big smiles when we encounter people who prove it. Read More: Is 4WD a Must? When one night we heard a distinct and familiar sound entering Hotel Oberland’s parking lot (in La Paz, Bolivia) we soon oohed and aahed over a beautifully restored Deux Chevaux, a car loved by me because of sweet memories of my year in France when I traveled the country with my then (French) boyfriend (oh, romance…) and by Coen because a Deux Chevaux was his first car. We soon discovered that Julie & Jean-Baptiste (also known as J.B.) are spirited people, driving a fantastic car. But there is more to their journey: 20 schools in France are following their travels, learning about the countries Julie and J.B. are crossing thanks to their personally developed carnet pedagogigue. They want to share their knowledge of the world with kids and show them you can make your dream true. We thought the Americas would be a good place to go because most people speak either English or Spanish and we can manage that. Why not Africa? Since a lot of people speak French there? We felt it was not safe to travel in Africa, also because people and family kept telling us this. We didn’t go there ourselves so we can’t know, of course, but we figured that for a first trip it would be better to choose some safer grounds. Can you Explain the Name of Your Trip: “Au cours du monde”? We are both teachers, and 20 schools (19 primary schools + 1 highschool) in France are following our trip. Before we left we made a carnet pedagogigue for these schools, with information and exercises on each country we would cross. The schools follow our trip through the website and make the exercises in their carnet pedagogigue. Au cours du monde is a wordplay. It is derived from autour du monde (around the world), cours meaning a course, or class (one-hour lesson) and a cour being a playground (cour de récréation). Let’s learn a bit more about this couple, their dreams and spirit. Julie, 27 years, an art teacher in highschool. J.B. (Jean Baptiste), 27 years, a primary school teacher. 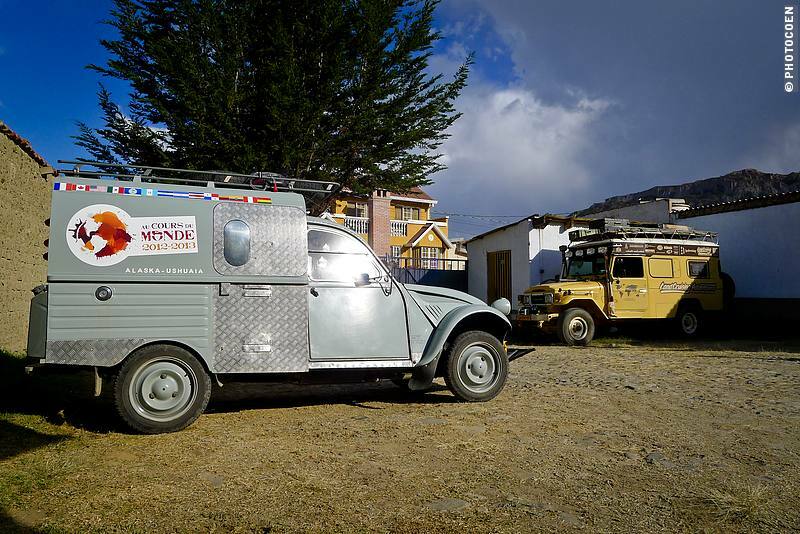 Vehicle: 1977, Citroën 2CV AKS 400 Fourgonnette named KKouette (pronounced as cacahouete, which means peanut). From Alaska to Ushuaia (most southern tip of South America); 14 countries; some 80,000 kms. 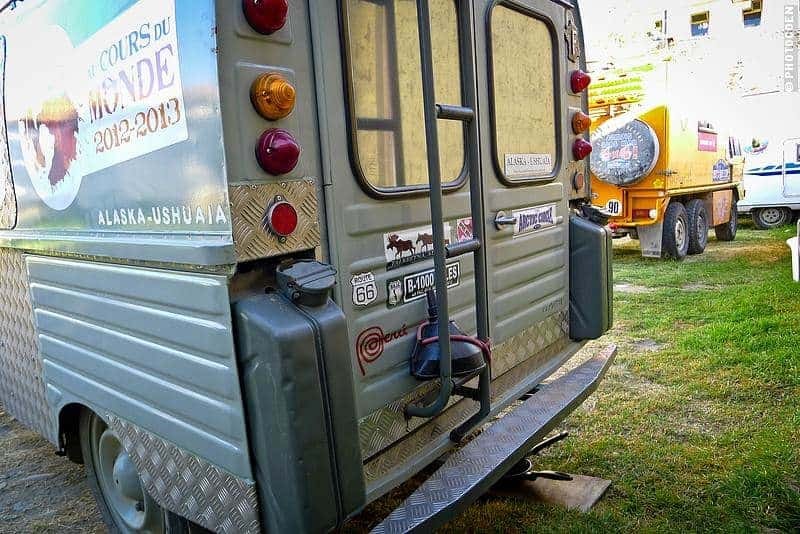 What inspired you to make an overland journey? J.B.: I read books from travelers with a 2CV in the 1950s and 60s and was captured by them. At the age of 18 I bought my first car, a 2CV. When I met Julie, we went on vacation with that car and I “contaminated” her with the travel bug. I told her about my dream to drive around the world in a 2CV. I was afraid she would say no, however, she was in right away. So we bought this one in 2009. 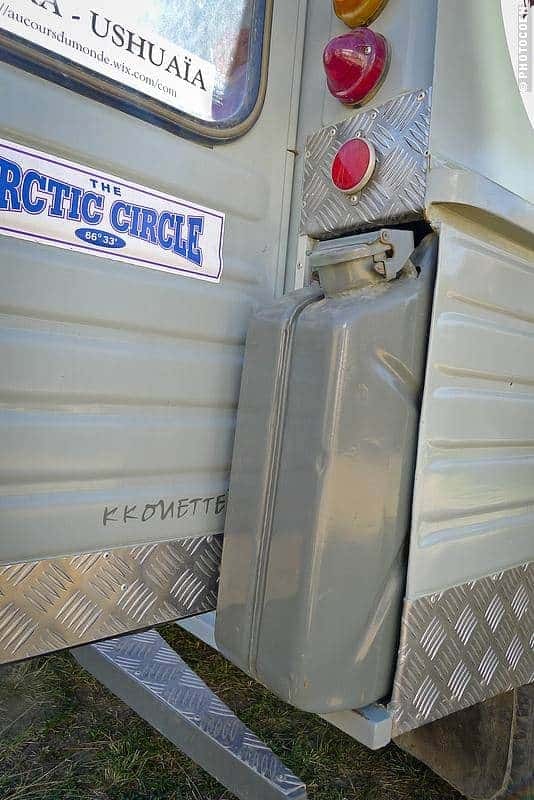 It was a wreck and decided to rebuild it. How did you find the schools in French? Through colleagues who want to follow our trip and somehow it snowballed from there. Can you tell more about the project? We have visited schools in Canada, USA and Mexico. In Central America it was a school holiday so we couldn’t go to schools but instead visited centers for children who live on the street. In Ecuador we visited a school, in Peru a kindergarten while in Mexico we also visited a university. We write about these schools, the kids, the teachers and their systems and share this info with the French schools. Two years ago we intended to plan the visits to schools and sent emails like, “Can we visit your school in 1,5 years?” and they would reply, “Sure, but maybe I no longer will be the director then so I can’t say.” So we stopped planning except for Canada, US and one contact in Quito. Now we just talk to locals and take it from there. It’s fun to see how things go sometimes. In Mexico we visited a school where somebody said, “But you have to visit our Technical School for adults as well”. So we did and then the man said, “Let’s visit the Cooking School, it is good for your project,” so we did as well and eventually ended up at a University. In Quito (Ecuador) we visited a French School, and the teacher asked they could use the carnet pedagogique as well. They have been following our trip since then too. Which school or project impressed you the most? In Peru we visited a kindergarten in a poor suburb where mothers had no money to bring kids to a kindergarten. Two persons had created a foundation with assistance from France to finance a kindergarten for which mothers don’t have to pay, but who contribute by doing volunteer work in the kindergarten one day a week. By having a kindergarten the mothers have their hands free to work. Will you do something with the French schools on your return? In fact we have another project. Julie is an art teacher. At each primary school we give the children a sheet of paper on which we have drawn the outline of our vehicle. We ask them to color it in with what represents their country, or city. We collect all these drawings and in France we will organize an exposition with all these drawings. It’s interesting to see the differences among those kids. Sometimes it’s hard because in Peru the kids we visited are very poor so don’t know what to draw or paint. They never traveled, so we try to explain they can draw their city or family; whatever is their life. In Ecuador, on the other hand, we visited a school from the upper class and these kids could represent their country beautifully in these drawings with landmarks and such. Nifty structure to carry extra water. We are teachers, we love children, we want to share. In each school, in France as well as on our journey we try to get the same message across. We say that if you have a dream, you can make it happen. We don’t know if the little ones really understand what we are talking about but in the adult schools and universities it definitely came across. 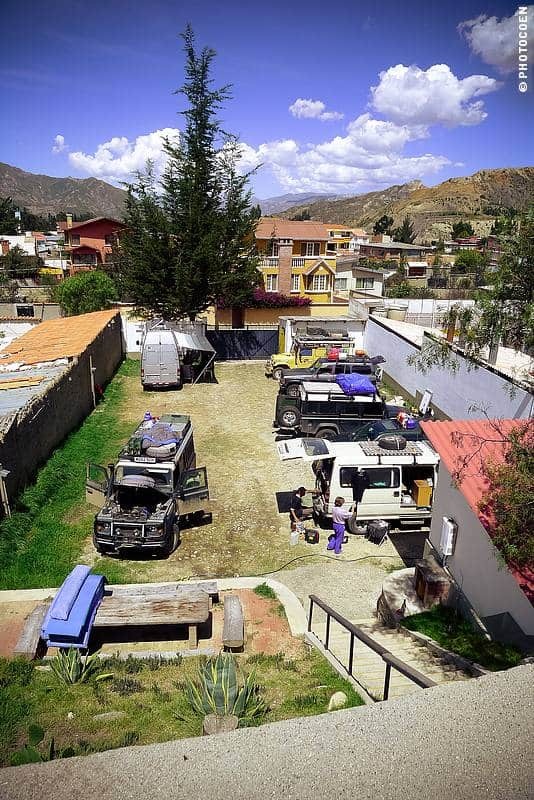 Read More: Why Drive the Pan-American Highway? Let’s talk a bit more about your trip. What has been your biggest challenge on the road? Costa Rico, National Park Peninsula de Corcovado. There was this road partly closed off except for 4×4 and everybody told us we couldn’t go. We did anyway. It was very tough and we got stuck twice on hazardous stretches but twice a 4×4 pulled us out. The trip finished at the beach and there we wondered what the heck we were doing – we would have to take the same track back to return and we felt we had reached limit. In fact, we were a bit depressed about it. We realized we had gone too far. But while we talked about this, a sea turtle came onto the beach and lay her eggs just 2 meters from the car. It was an incredibly imposing sight, all the more since there was nobody on that beach but us. That made us conclude it was good to have come here and the next morning we returned without too many problems. In the US we stopped saying we were going to Ushuaia because everybody already called us crazy when we said we were going to Alaska. They didn’t (and don’t) believe it was possible. Alaska was already too difficult to comprehend for them. But we are showing you can. And you know, there are so many bicyclists out there. We deeply respect them. Compared to them we have so much: a bed, a kitchen. In one particular stretch we always stopped to make tea for the cyclists and had nice contacts like that. 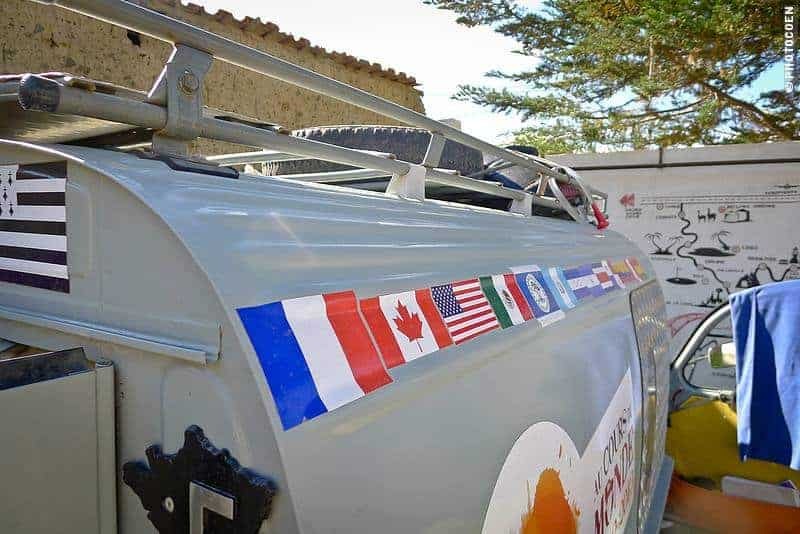 Stickers of the countries Julie & J.B. have crossed thus far. Any unexpected things on the journey? Things that differ from expectations before you left? The trip is so much better. I read in books about meeting locals but I figured that now, in the 21st century with so much tourism, this would be very hard. But, in fact, I don’t know if it’s our car, or if it’s for everybody but everywhere people have been very generous. Thanks to our journey we believe in humanity again. In France you only read bad stories about the world in newspapers and on TV but now we see the other side and that’s very inspiring. In the United States we visited a school where we stayed for a week. At the end a parent decided we needed money, which we didn’t, but she really wanted to give it to us. So she made a bunch of crêpes (thin pancakes) and sold it to parents in the school’s courtyard. They also took a lot of pictures of us and sold them to the parents as well, and in this way collected a lot of money for us. It was crazy and showed us a beautiful mentality of Americans. They have proven to be very generous. Do you have a tip for people who are thinking about making a trip? You have to go! It’s the best experience of your life and you have to do it. Don’t listen to all these people saying it’s impossible, or you can’t do that because you have to work and so on. Don’t listen. If you want to do it, do it. 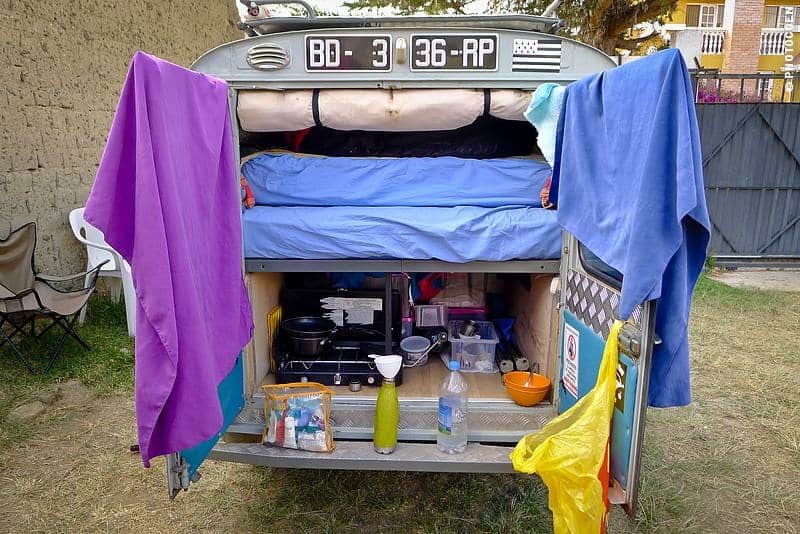 I tell you: these people are creative and in the world over overlanders, true minimalists. What was the most important part of your preparation? The car and finding the sponsors and making the carnet pedagogique. But it was not a job. It was a lot of fun. We say that our trip did not begin last July but 2 years ago on the day we decided to do this trip. Talking about that day brings back fond memories. J.B.: Two days ago I talked it about with Julie and we decided to do this and all afternoon we talked about it. We found the name and it was such a beautiful day. So the trip started that day. J.B.: I feel so privileged that I found somebody to share this with. I realized I wanted to do this with such a small car and wondered if I would ever find a woman who would want to do this travel with me. This trip gives a lot of confidence for future trips as well. Do you have future plans to travel? 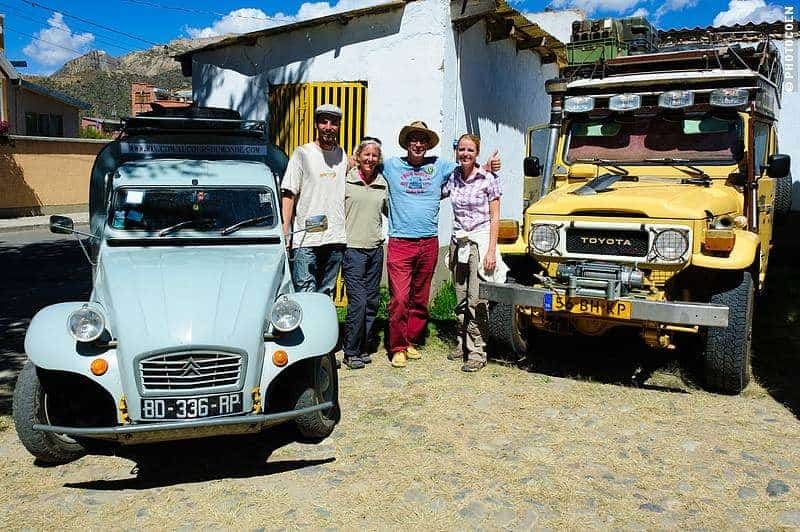 Yes, we’d like to do more trips with this car, also to other continents like Russia and Mongolia. For the time being are afraid of Africa but as we travel we realize we should just go. To which Julie adds: It is like Mexico. Everybody only had bad stories about Mexico but we had a great time. It is a good country. Our logo now has the Americas and the date 2012-2013 but in the future we’ll surely change the map to another continent and another date. Every 10,000 kms we change tires, every 5,000 kms we change oil and every day before leaving we check the oil, tire pressure and so on. We carry a couple of spare parts because in the U.S. they don’t have this car. However, thus far we haven’t needed them. Here it’s no problem because in Chile and Argentina there used to be a Citroën factory so there are still many Citroëns driving around. We had 2 flat tires but other than that we haven’t had a breakdown. In Canada there is no factory but there are 2CV clubs. We met them and they were very excited to meet us. We hope to meet some clubs in Argentina and Chile as well. But then, We don’t have a fixed plan. We don’t want to. We want to be open to whatever or whomever who comes on our path. We’ll take it as it comes. 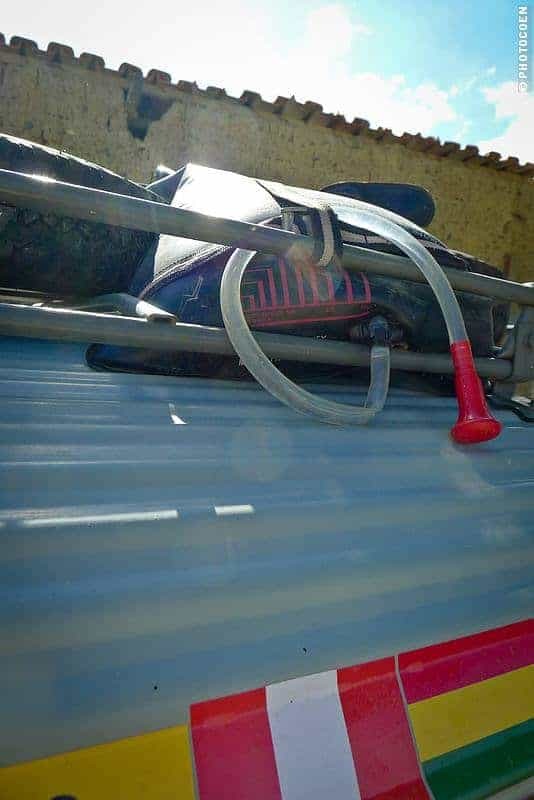 We found this car in the Pyrenees. This used to be a farm vehicle so when you find one, it’s general in bad condition. The owner started the engine but advised us to put it on a truck to bring it back to our hometown. But we were students and had no money for that. So we went by train to pick it up anyway and we drove it ourselves anyway, 700 kms home. We survived but it was a good start of our adventures. To learn more, check out Julie & J.B.’s website Au cours du monde. Way a great story, and yes, the car is a major character that I think warms the hearts of all who meet them! Coen, did you take enough photos of this to make a paper model? 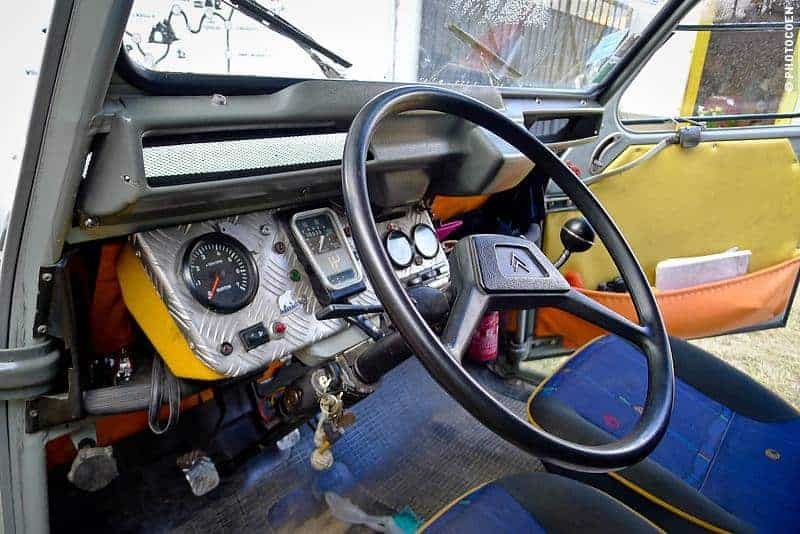 Hi Jesse, I think I have some interesting shots of the 2CV from all angles. If not sufficient, I’m sure JB or Julie will provide additional images if needed. 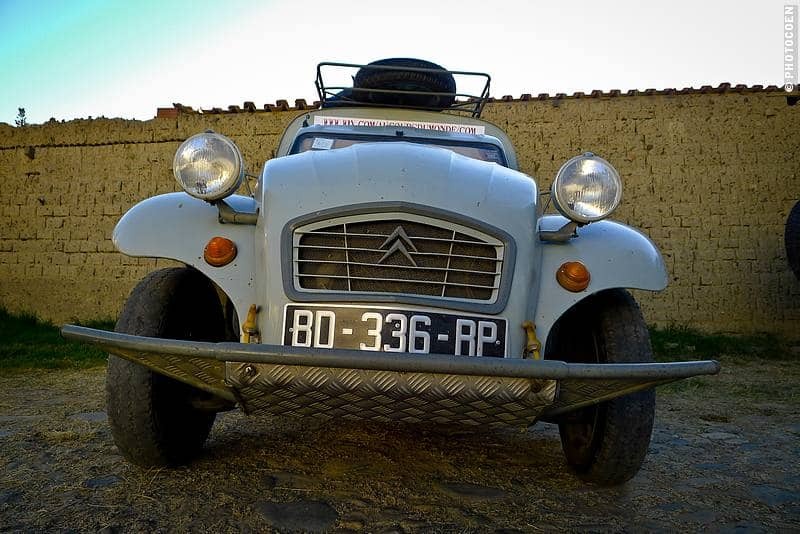 Are you thinking of making one of your super duper paper models of the Citroën? A Paper Model of KKouette !!! It could be very FUN !!! If you want more pictures Jesse, don’t hesitate !!! This is great! I am planning a trip through Africa in my 1972 Austin Mini Panelvan, and so many people have told me its impossible! Fantastic to see there other poeple doing the “impossible”. Great Motivation to keep moving forward! We know… if you follow the all ‘it’s impossible’ remarks / warnings we travelers would get nowhere. Our motto: in the worst case you can’t do it / get there and you’ll have to make new choices. No sweat. Believe in what you do and want to do and go for it! Great post! I was introduced to the idea of overlanding by my childhood best friend and his girlfriend who recently drove from Yellowknife, NT, Canada (the far North) all the way to Sayulita, Mexico! It’s a very inspiring and exciting story, and neat to see other people living their dreams.